One of the world’s most sought-after opera singers, Michael Fabiano is currently performing the lead at San Francisco Opera’s Manon and will be performing Verdi’s Rigoletto at the London Royal Opera House Dec. 14 to Jan. 16. Come and enjoy Michael’s amazing voice up-close at a magnificent Ross estate and support his ArtSmart charity foundation that provide free music lessons to school children. 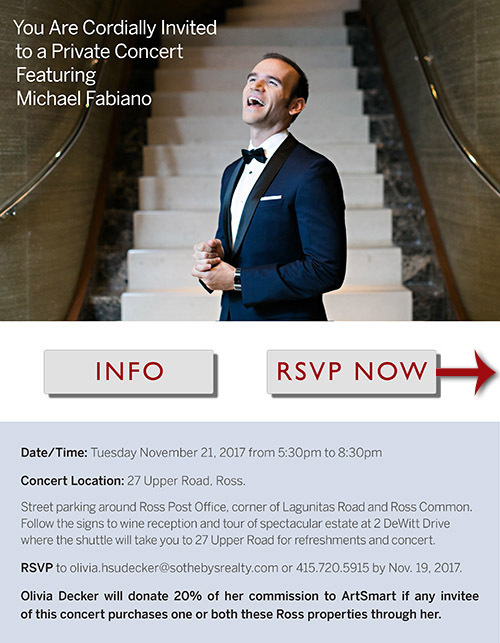 Please make $200 donation at door or make donation at ArtSmart.org/Donate/ or Patreon.com/ArtSmart Meet Michael on MichaelFabianoTenor.com if you are unable to meet him in person. Concert Location: 27 Upper Road, Ross. Street parking around Ross Post Office, corner of Lagunitas Road and Ross Common. Follow the signs to wine reception and tour of spectacular estate at 2 DeWitt Drive where the shuttle will take you to 27 Upper Road for refreshments and concert. 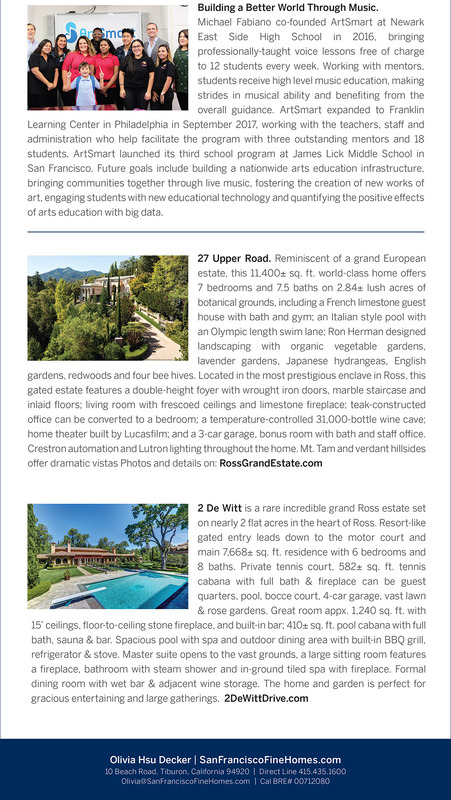 RSVP to olivia.hsudecker@sothebysrealty.com or 415.720.5915 by Nov. 19, 2017. Olivia Decker will donate 20% of her commission to ArtSmart if any invitee of this concert purchases one or both these Ross properties through her.